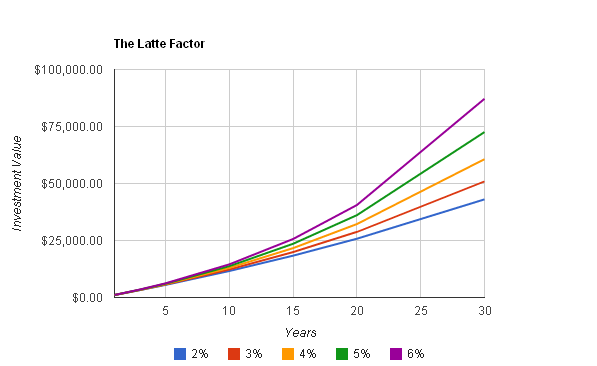 Do an internet search to determine what "The Latte Factor" is? Write a brief explanation of The Latte Factor in the spreadsheet you are about to create. Use your Latte Factor in this spreadsheet. if you wish you may choose your latte factor to be either weekly or monthly. Make sure you change your spreadsheet accordingly. Create a line graph for the data above. The graph will show how the value will grow overtime for each interest rate. Do this only if you have finished everything! There is a spreadsheet function that will do the same calculations that are done by the Latte Calculator. The difference is that, if you construct your formula correctly, the formula can be copied and pasted to fill all the values in the table. In Google Docs it is the =FV( ) function or the Future Value function -- see if you can re-do this spreadsheet with the =FV (future value) function.